Gemstone Bead Size: (approx.). 8mm,spacer beads 7 3mm. Material: Gemstone & Alloy. Length: (approx.). Bead size: 8mm. unisex ring. jewelry set. Sincere greetings! After-sales service. Length: 8". Material: Tigers Eye. Product Overview. 3pcs Vintage Men Women Mala Buddha Buddhist Prayer Bead Tibet Bracelet Bangle Material:Ceramic Size:19"(48cm)*0.24"(6mm） Weight:30g Color:As the picture Package Includes: 3pcs*Bracelets 1*Gift Bag This bracelet is 100% Brand New And High quality.Its special design will make you look unique. It is a good gift for your lover,family,cowoker,friends.It make you charm and elegant. Brand Unbranded Style Chain Metal No Metal Metal Purity Unknown UPC Does not apply MPN Does not apply EAN Does not apply Material Ceramic Main Color As the Picture. Material: Matte Onyx, Brown Tiger Eye. NOTE: We cannot customize products. No podemos personalizar productos. Size:6mm Matte black bead:8mm. Length:180-210mm Nature Crystal Bead. Size: Bracelet. Rusty Red Wood Bead Bracelet Beads are 8mm. Beads are not all perfect & have some flaws. They are Wooden Beads. These stretch. 7” - 8.5” Wrist Light weight - Stack them with other colors! Style: Ethnic Tibetan Buddha. 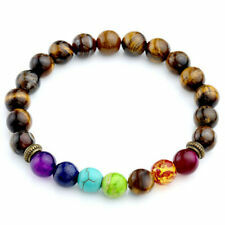 Type: Prayer beads,bracelet. Fine mahogany wood with woody fragrance. Mahogany in China is referred to as sacred. Retro copper coins with totem patterns. Ethnic Tibetan Buddhism stylish bracelet. 1x Buddha Beads Bracelet. Material: Wood. Buddhist bracelets, you can wear it yourself, also you can buy it as gift to your families, lover, or friends. Wooden bead bracelet, pray for peace and health. Bead Quantity: about 108 Pcs. Bracelet Width: 0.8cm. Gemstone Bead Size: (approx.). Length: (approx.). Size: app.Buddha Head 13 9 8mm. It was commonly associated with the qualities of energy, assertiveness, and passion, while earth was commonly associated with qualities of practicality, restraint and materialism.